I have big plans for the nursery's closet. When we moved into the house, one of the first things Carter did was remove the old accordion-style closet "door" (not really a door, more of a sliding canvas curtain-type situation) with the thought that we would soon replace it. You'll be shocked to know that that never happened. 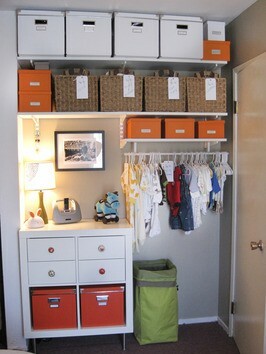 The closet became Carter's and having it open was rather convenient since that room was only used by him. 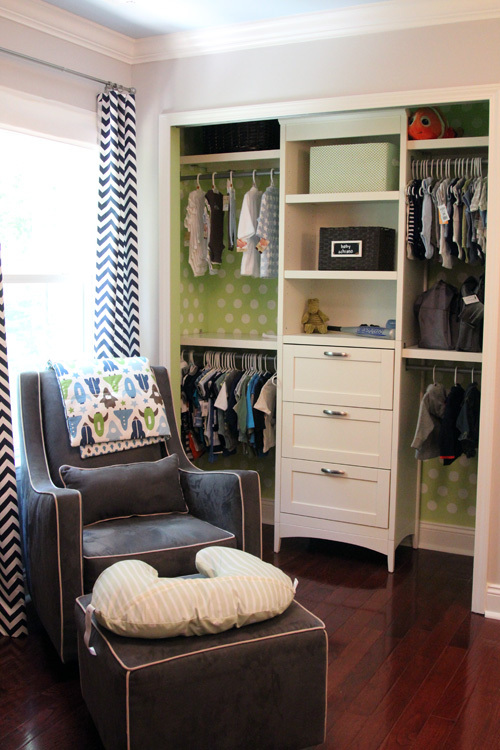 Our nursery is a good size but I think that closet doors will still get in the way and I'm becoming enamored with the idea of doing an eye-catching wall treatment inside the closet to give it some definition while making it decorative. And since baby clothes is so wee, I imagine that I will store most of it in our dresser for a while so hanging space can stay relatively organized. The closet will be the last thing we tackle so I hope I don't run out of decorating and DIY steam by then! I think you really need to think this through a bit more! There is a LOT to be said to closing the door on a mess. Not to mention a great place to hide in a game of hide and seek! 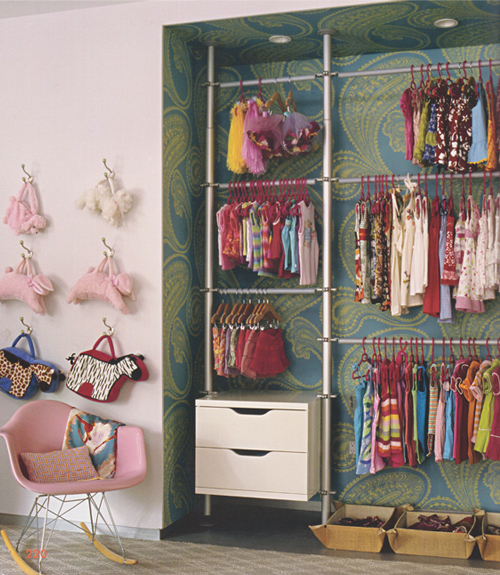 Do you really want to daily be styling this open closet???! I think the inspirational photos are adorable, and I think it would be a precious option for a wee one, especially a sweet little girl who will have an amazing wardrobe, I'm sure! However, as a mother of two girls (6 & 9), I think maybe you might want to hold on to your closet doors in case you decide you want to reinstall them later.... It can be a little crowded/unkempt in my girls' closets these days, and their bigger clothes don't showcase as well as sweet baby clothes! I love this idea not only from a practical standpoint but a decorative one too. This could turn out to be quite a focal point in the nursery. I think the first commenter has a point. The inspiration pics are marvelous but its important not to underestimate the fatigue you can feel with a baby. As the mom of five, I love to close the door on a mess when I do not have time or energy to fix it. 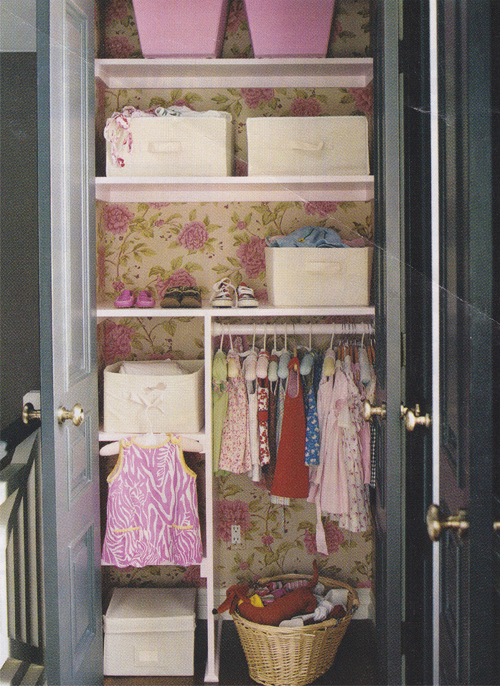 I am am sure you would rather be cooing over her darling face than tidying a closet on a regular basis. If you are able to keep such perfection going..you are my hero.